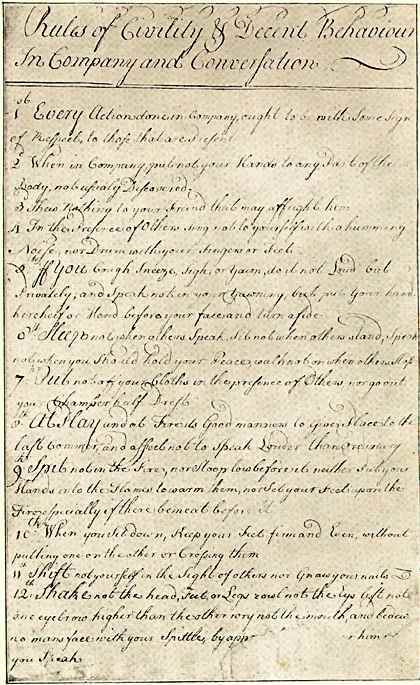 Rules of Civility was copied down by George Washington when he was about 16 years old. It is a set of proverbs and maxims that came originally from France and is designed to instill social virtues in young people. Rules of Civility is often credited with influencing George Washington to develop his well known character and virtue. 31st If any one far Surpassess others, either in age, Estate, or Merit yet would give Place to a meaner than hims[elf in his own lodging or elsewhere] the one ought not to except it, So he on the other part should not use much earnestness nor offer it above once or twice. 32d To one that is your equal, or not much inferior you are to give the cheif Place in your Lodging and he to who 'tis offered ought at the first to refuse it but at the Second to accept though not without acknowledging his own unworthiness. 33d They that are in Dignity or in office have in all places Precedency but whilst they are Young they ought to respect those that are their equals in Birth or other Qualitys, though they have no Publick charge. 47th Mock not nor Jest at any thing of Importance break no Jest that are Sharp Biting and if you Deliver any thing witty and Pleasent abstain from Laughing thereat yourself. 61st Utter not base and frivilous things amongst grave and Learn'd Men nor very Difficult Questions or Subjects, among the Ignorant or things hard to be believed, Stuff not your Discourse with Sentences amongst your Betters nor Equals. 66th Be not froward but friendly and Courteous; the first to Salute hear and answer & be not Pensive when it's a time to Converse. 69 If two contend together take not the part of either unconstrained; and be not obstinate in your own Opinion, in Things indiferent be of the Major Side. 88th Be not tedious in Discourse, make not many Digressions, nor rep[eat] often the Same manner of Discourse. 96 It's unbecoming to Stoop much to ones Meat Keep your Fingers clean & when foul wipe them on a Corner of your Table Napkin. 100 Cleanse not your teeth with the Table Cloth Napkin Fork or Knife but if Others do it let it be done wt. a Pick Tooth.